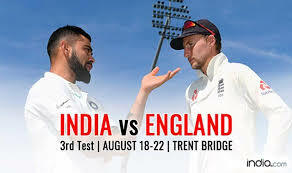 India vs England 3rd test match of India tour of England series being played in Trent Bridge Nottingham from 18 Aug 2018 to 22 Aug 2018. England has won previous two matches of this series of 5 test matches. Team India did a very bad performance in both previous test matches. Team India has a strong batting order but in previous matches, it looked very weak. Only Virat Kohli and R Aswin bated well and scored some useful runs but other batsmen couldn't do well, that was the cause by which India lost their first two matches. Team India has changed many of their players for this match to expect a good result. It may be beneficial or not only should be decided after watching live cricket score. Jasprit Bumrah and Rishabh Pant may replace respectively Kuldeep Yadav and Dinesh Kartik. Shikhar Dhawan may join the team for this match in place of K L Rahul or Murli Vijay. Pitch report shows that it may be helpful longtime for seemers so J Anderson could do well for England. Pitch will stay good for a long time so batting even on the last session would be good. In this Ind vs Eng 3rd test match, team India will have to give their best performance to save the series. After changing the structure of teams look like this. Virat Kohli(c), Rishabh Panth(w), Ajinkya Rahane, Shikhar Dhawa, K L Rahul, Cheteswar Pujara, Hardik Pandya, R Aswin, Mohammad Sami, Ishant Sharma, and Jasprit Bumrah. Keaton Jennings, Alastair Cook, Joe Root(c), Ollie Pope, Jonny Bairstow(wk), Jos Buttler, Ben Stokes, Chris Woakes, Adil Rashid, Stuart Broad, James Anderson. Shikhar Dhawan and K L Rahul started the inning for India and did 60 runs partnership for 1st wicket. Chris Woaks got 3 wickets, the wickets of Shikhar Dhawan 35, Rahul 23, and Pujara 14. Kohli got 18th and Rahane 14th test half century. Broad got the wicket of Rahane who played a great inning of 81 with the help of 12 boundaries. Virat Kohli lost his wicket 3 runs short to his century. Adil Rashid got the wicket of Virat Kohli who scored 97 runs in which he smashed 11 boundaries. Anderson got the wicket of Hardik Pandya who gave the support of 18 runs. In this Ind vs Eng 3rd test, India scored 307 runs for the loss of 6 wickets. You will get Ind vs Eng 3rd test live cricket score of Day 2 on my next post.